Erase the visible signs of aging and reshape your facial contours. Dr. Leila Kasrai applies gentle techniques for minimal swelling and bruising. Your know that your face can look better. With wrinkles and creases that only get worse with time, and facial features that are disproportionate, you aren't happy with your appearance and want change...without surgery. Injectable fillers are essentially gels that contain hyaluronic acid (HA). These smooth, colourless gels are injected into your skin at varying depths. Hyaluronic acid is found naturally in your skin, responsible for maintaining its elasticity, suppleness and volume. Aging can cause levels of HA to deplete, which is one of the reasons why you develop wrinkles, creases and sagging. An injectable filler treatment requires just a few minutes to complete at my office. You'll see immediate improvement with little recovery time. There are many injectable filler products available today. However, I only offer those that can achieve the natural, subtle improvement that you want. I've also found that the products I use do not cause any problems, such as excessive swelling. We offer the most popular injectable filler in Europe. It is also one of the leading dermal fillers in Canada. This product comes in two formulations: the original and a thicker gel. The latter is a little thicker in consistency, making it more suitable for serious volume loss in the cheeks, temples and along the jawline. It's also great for more extensive correction of the nose and lip contour. In fact, this is fantastic for non-surgical nose jobs, particularly to camouflage dorsal contours and deviations. Long-lasting results are achieved with a stabilized form of hyaluronic acid dervied from a non-animal source. This product is designed to support your facial expressions, rather than masking them. It's great for wrinkles, volume loss, hollows and feature reshaping. I've found that one of the products in this range is particularly good at filling in the deep hollows that develop under your eyes (tear troughs). In fact, it's been approved by Health Canada for this concern. This type of filler provide moderate to dramatic correction of wrinkles, creases and undesirable facial contours. Unique qualities include the level of concentration in each of its products, the ability to achieve the maximum effect at varying layers of your skin and a cross-linked particle structure that ensures your results last long. 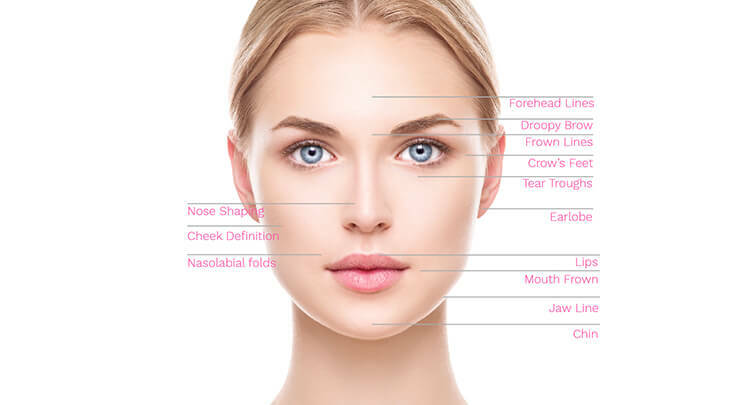 Areas that can be treated with injectable fillers. Swelling and bruising are common side effects associated with the injectable filler treatment. It's the injection technique that determines their severity. Taking this into consideration, I've designed an injection process that minimizes and prevents bruising and swelling. For this reason, 80% of my patients experience very little of either side effect following their injection. You'll enjoy a less intense recovery period and results that appear faster, because you won't have so much swelling and bruising. To do this, I recommend you take Arnica before and after your injection. I also apply precise injection techniques that respect the delicate tissues and vessels in the area treated. To treat wrinkles and hollows in the undereye area, for example, I'll use The microcannula injection technique. For the lips, I'll use micro-injections. Micro-injections give ultimate control over your lip enhancement treatment to create very natural results, so they don't end up being over-done or looking like a "trout pout". Some topical numbing cream in the areas you want to have treated can be applied before the injection. This helps improve your comfort. A pre-filled syringe of the product that is most suitable to address your concerns is gently injected into the desired areas. Usually, a couple of injections are made to allow for a smoother, more even contour. You should experience minimal discomfort, bruising and swelling that gradually subsides over a few days. Avoid touching the treated area or performing rigorous physical activity for a day or two. You may also want to avoid hot baths and eating spicy foods, which can increase swelling and bruising. A noticeable improvement is usually visible immediately, however please allow for two weeks to pass to see the full results of your injection. Touch-ups can be performed every few months to maintain your great new look. Research has found that the more treatments you get, the longer your results will last with every treatment. With the gentle, precise manner in which I perform your injections, you'll enjoy a subtle improvement that you'll be able to see immediately. Your results will last longer with repeated treatments — the hyaluronic acid in the fillers has been scientifically proven to enrich your own skin structure, boosting collagen and moisture levels for smoother, healthier skin. Injectable fillers are gels that are comprised of beneficial ingredients that, when injected into the skin, work to add volume, plump up, and smooth away lines and wrinkles. While they can be composed of a variety of ingredients, I offer those featuring hyaluronic acid. HA is a naturally occuring sugar in our skin and body. Injectable fillers are suitable for men and women who want to erase wrinkles and replace volume loss caused by aging, or redefine facial contours. You should be healthy and have realistic expectations of the procedure. This treatment may not be suitable for you if you have inflammation or an infection in the area that you'd like to have treated. Although it is extremely rare, you should also not have any known allergies to the ingredients of the filler product. Where do I get my treatment? Your treatment requires no surgery. It is a simple injection that can be safely performed at my office. Your treatment shouldn't take more than 45 minutes to an hour. Usually, the prior consultation takes longer than the actual treatment! You may feel some mild discomfort but topical anesthesia is applied to help with this. You'll be able to see an immediate improvement after your treatment, however minor swelling may hide your results. That's why you should wait for the swelling to subside. This generally takes about two weeks or less. Injectable fillers achieve temporary results that generally last from six months to a year. Repeated treatments will achieve longer lasting results.